(NaturalNews) It’s odd that studies are being done to “prove” certain medical arts have positive effects even after they’ve proven beneficial over centuries. This seems to be the case with Traditional Chinese Medicine’s (TCM) and its most widely practiced methodology, acupuncture. A meta-analysis is an overarching analysis of several clinical or laboratory study results with a similar purpose or theme to determine the validity of a basic thread or foundation. The researchers used 28 brain magnetic resonance image (MRI) studies from 51 acupuncture experiments and compared them with MRI studies from tactile stimulation experiments. The theme was pain and how needle stimulation affected the brain’s pain centers. Does testing a 2500-plus year proven medical art make sense? Interesting that this meta/analysis comes from a culture that has been steeped in TCM since it was absorbed from China in 560 AD. By now they know it works, right? It has repeatedly demonstrated its efficacy for pain relief with anesthetic applications during major surgery. So what would a meridian research center in Korea be doing with a study to prove acupuncture’s efficacy for handling pain with MRI technology in a western medical style comparison study do a meta-analysis and end it with a “future studies” phrase? That’s a commonly used conservative phrase to invite more research funds and/or give others a chance to shoot down the results and maintain their monopoly. But it may all be necessary to give acupuncture a real shot at opening up the insurance industry’s purses for a very inexpensive medical approach. Acupuncture sessions cost from $50 to $100 each, and generally they are spaced apart by a few days or more with ten to 20 sessions, sometimes less, to achieve desired results from an existing malady. Those rates are comparable to normal allopathic doctor’s office visits without any procedures. There are acupuncture colleges that offer supervised student rates at a third of that cost, but it’s not the same as having a practitioner handle your case. When you use an acupuncture school for treatments, you’re there for the students’ benefit. Either insurance companies are stupid, or they’re beholden to Big Pharma, the FDA, and the AMA, otherwise known as the medical mafia. They insist on a battery of double blind placebo peer reviewed studies to confirm efficacy on a much less expensive medical approach while accepting bogus reviews on extremely expensive therapies that often don’t work well and render worsening side effects. The major problem with doing studies to confirm acupuncture’s efficacy is that it’s based on a totally different paradigm than western allopathic medicine. The foundations are very different, yet western research continues to compare apples with oranges rather than understand and accept apples. Currently, chiropractors and acupuncturists are struggling in a few key states to gain acceptance from the health insurance industry. Four states – California, New Mexico, Washington, and Maryland are offering acupuncture insurance coverage on some specific ailments. It appears that Alaska and Nevada will be next. In order to convince insurance companies that cheaper can be better, TCM has to be translated into western allopathic terms. As long as the medical mafia considers empirical observation anecdotal and not “scientific,” the studies to validate what’s known to work will continue. Tweet (NaturalNews) Acupuncture outperformed both placebo and conventional pain therapies – including. Tweet (NaturalNews) Allergic rhinitis, internal nasal mucous membrane inflammation, plagues many during. Tweet (NaturalNews) Most NaturalNews readers have anywhere from a vague understanding to a first-hand. Tweet (NaturalNews) A unique and not well known type of acupuncture in. 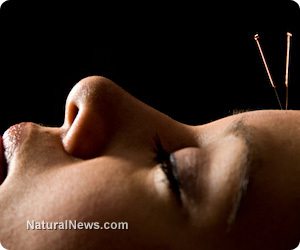 Tweet (NaturalNews) A growing body of research suggests that acupuncture may be.